For information on how you can get involved, please contact any of the below advocates or advocacy organizations. 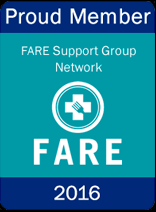 FARE is currently working on expanding the reach of FALCPA to include additional allergens to the top 8 that cause problems for allergic families when they are not disclosed on labels. Unfortunately, the FDA can’t just “add” additional allergens to this list of 8. FALCPA was an act of congress that specifically wrote in which allergens were to be included. The FDA has no authority to add anything else to this law. There are only two ways to fix this. 1) A law could be passed adding specific allergens to FALCPA or 2) A law is passed giving the FDA the authority to make these sorts of additions as they see fit. As hard as FALCPA was to pass, this will be just as difficult. FARE’s Advocacy Department is in charge of this endeavor. In the meantime, FARE has several grant requests out to start treating sesame as was done with the other top 8 allergens before FALCPA passed (label-reading sheets, etc.) which will hopefully have an impact by 2015. For more information on FARE’s advocacy work, contact Jen Jobrack at jjobrack@foodallergy.org.